Astrophotographer Mike Taylor took this image on May 27, 2014 from Bootlegger Canyon just outside of Moab, Utah. 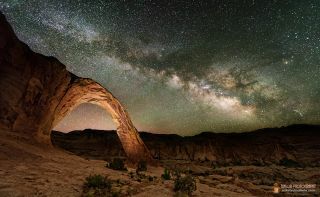 The glimmering Milky Way seems to sit atop the Corona Arch in Utah in this spectacular photo captured by a veteran night sky photographer. Astrophotographer Mike Taylor took this image on May 27 from Bootlegger Canyon just outside of Moab, Utah. To capture this view, Taylor used a Nikon D600 camera & 14-24 @ 14mm f/2.8 at a 30 sec exposure and ISO 3200. The Corona Arch was lit with an orange LED to match the surrounding landscape. This image is a blend of two shots, one for the sky and one for the foreground.